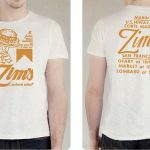 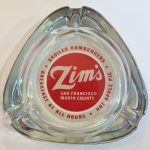 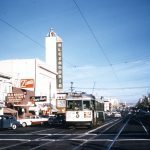 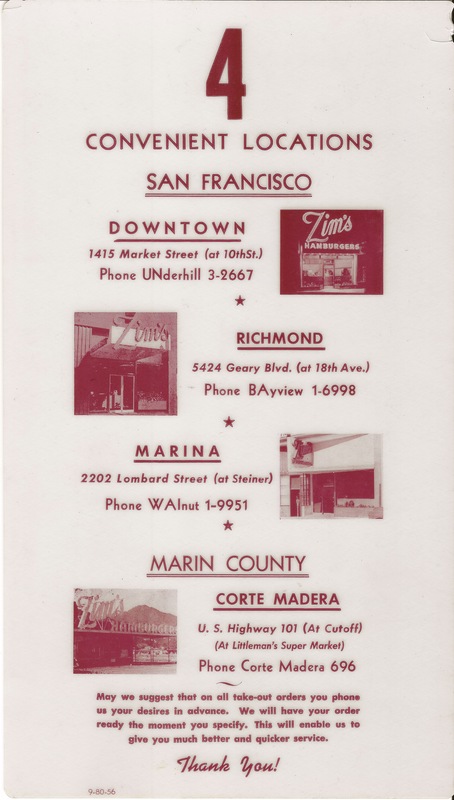 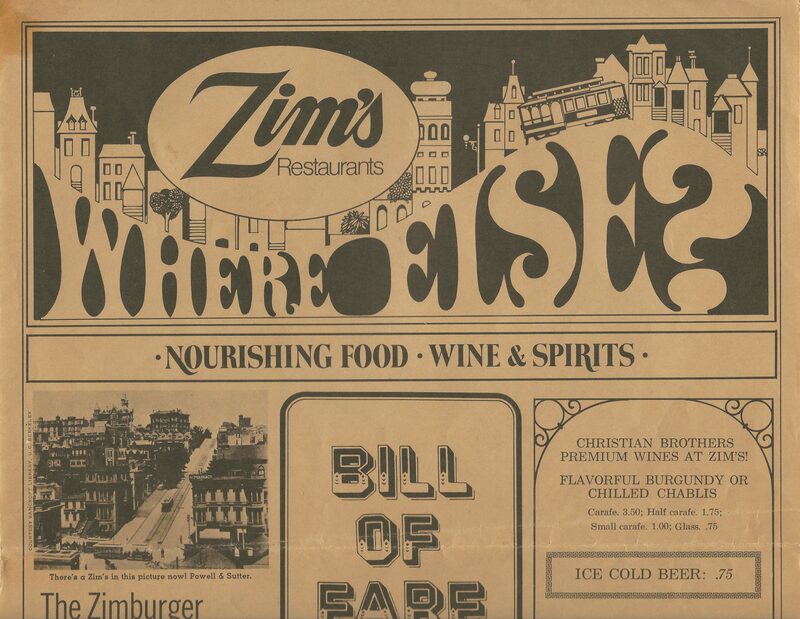 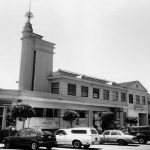 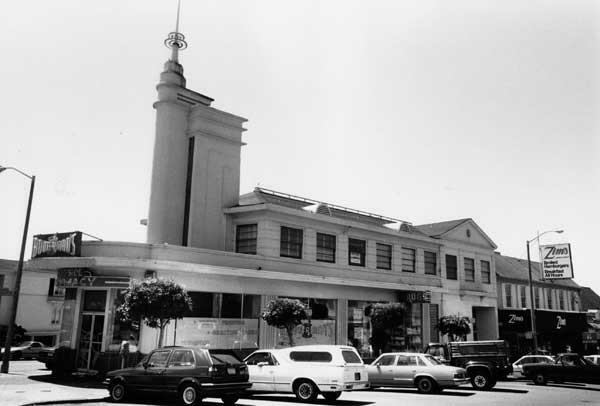 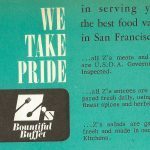 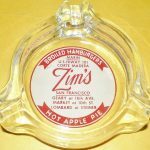 Found in 1947, with 37 locations, Zim’s Restaurants was the largest independent, non-franchised restaurant chain in San Francisco for nearly 50 years. 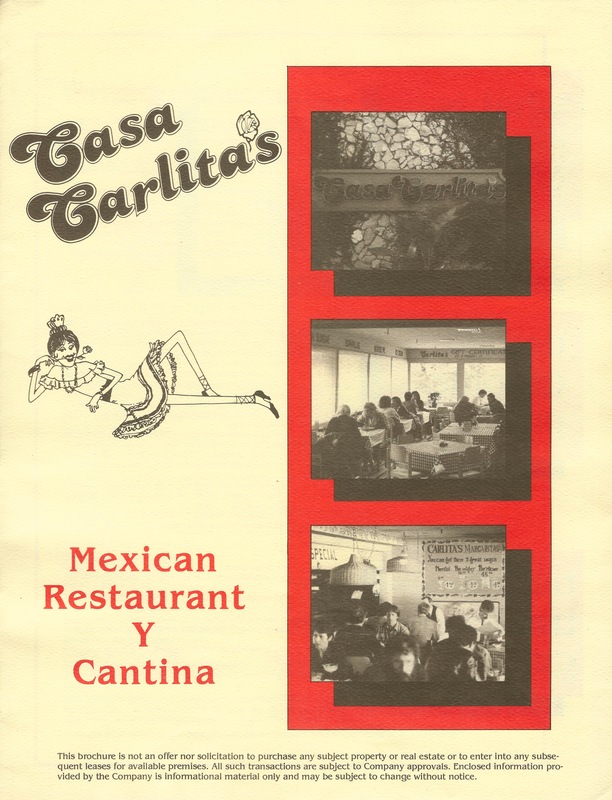 with 37 Locations from 1947-1995. 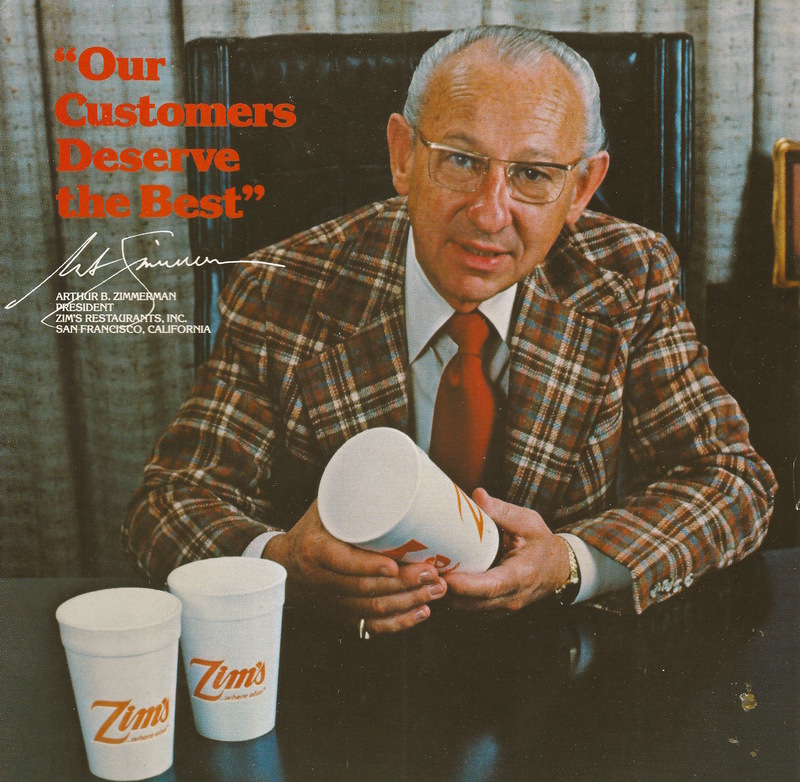 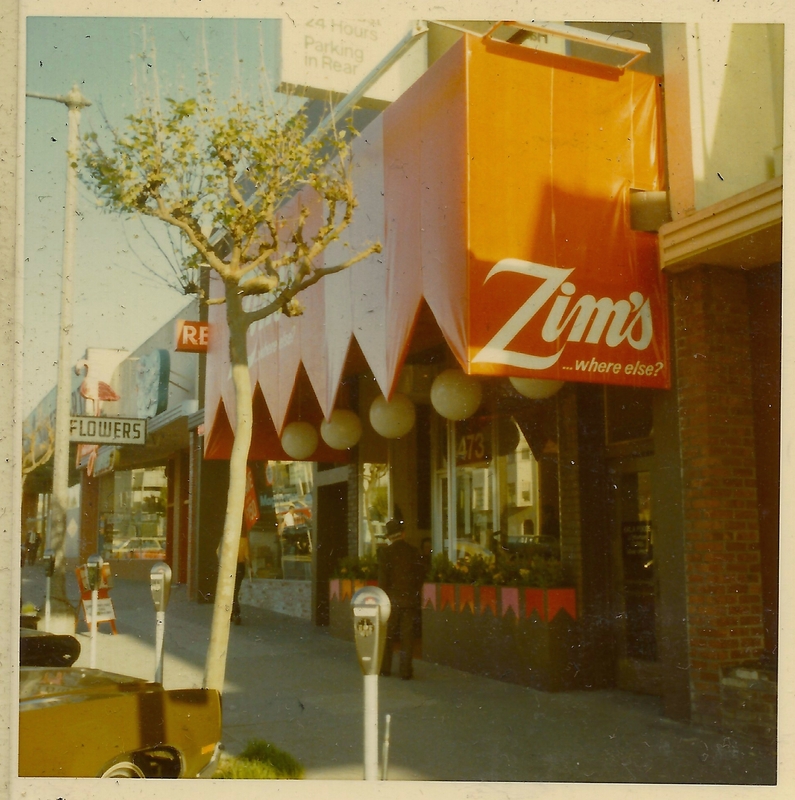 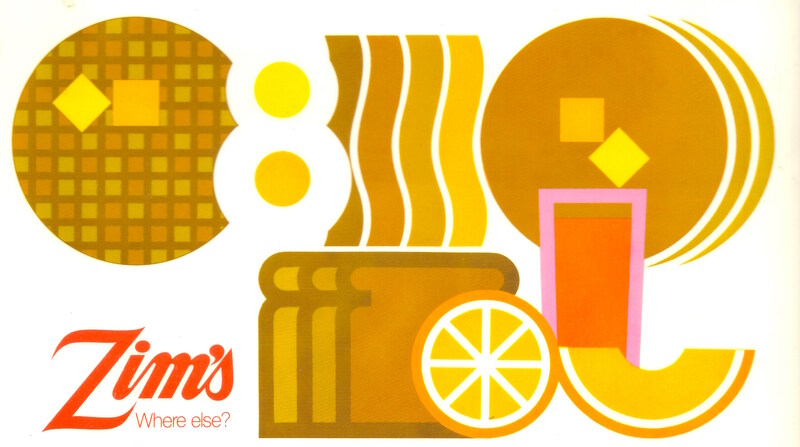 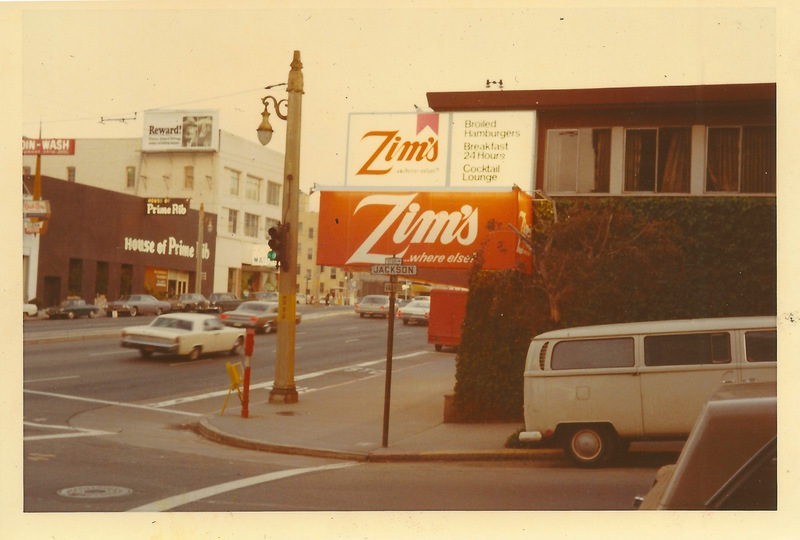 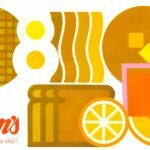 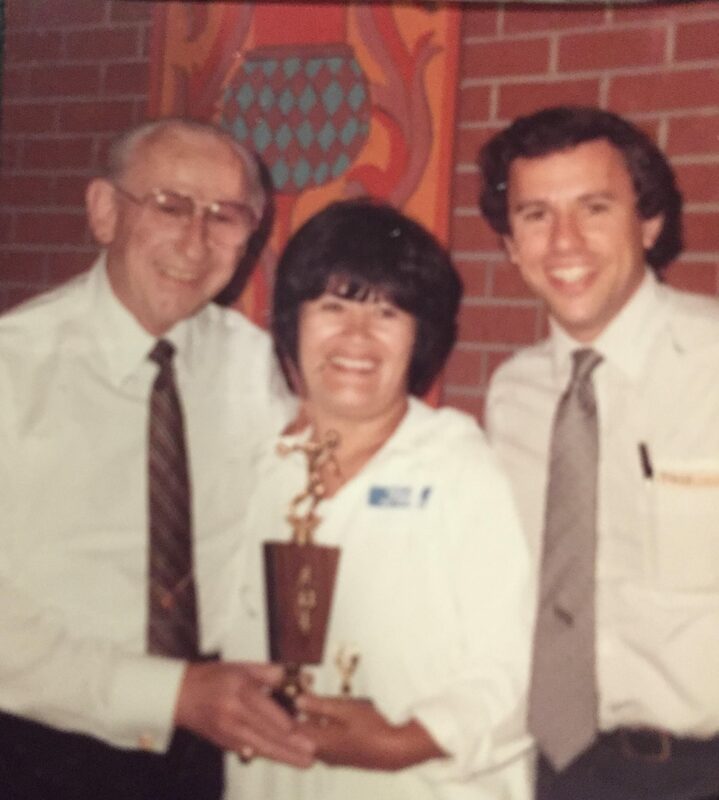 Zim’s was the largest independent, non-franchised restaurant chain in San Francisco for nearly 50 years. 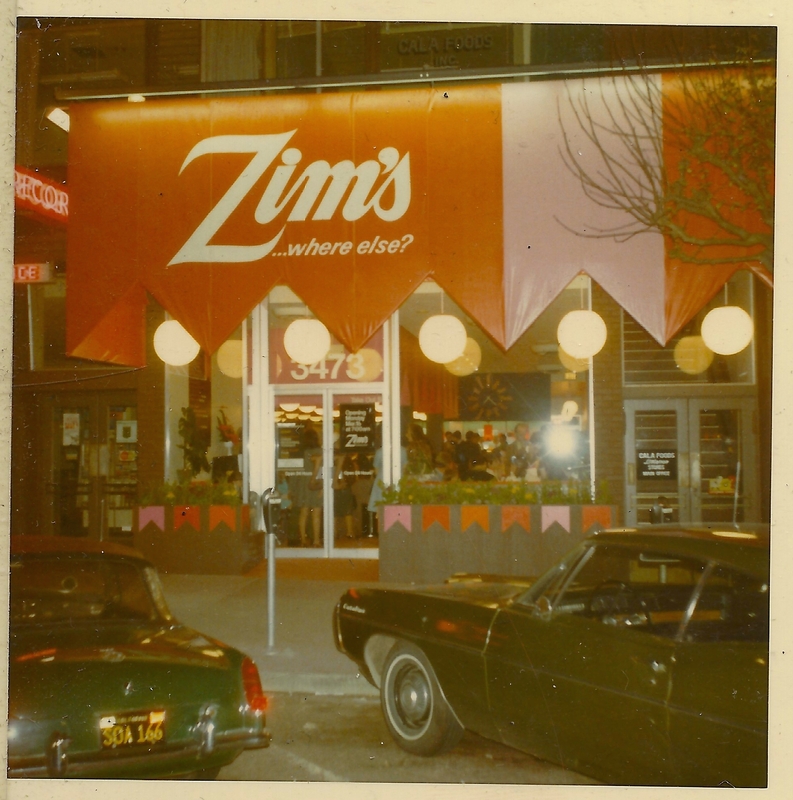 For years, Zim’s was the largest privately held restaurant chain in the region – with 26 restaurants. 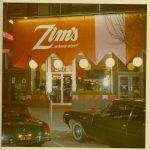 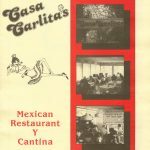 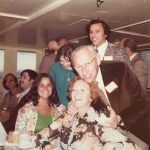 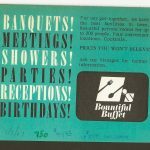 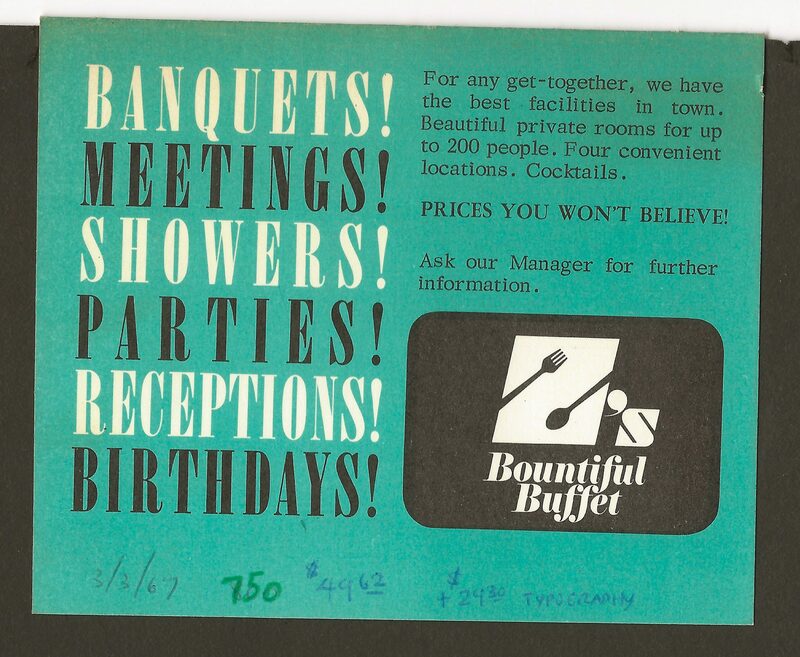 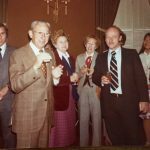 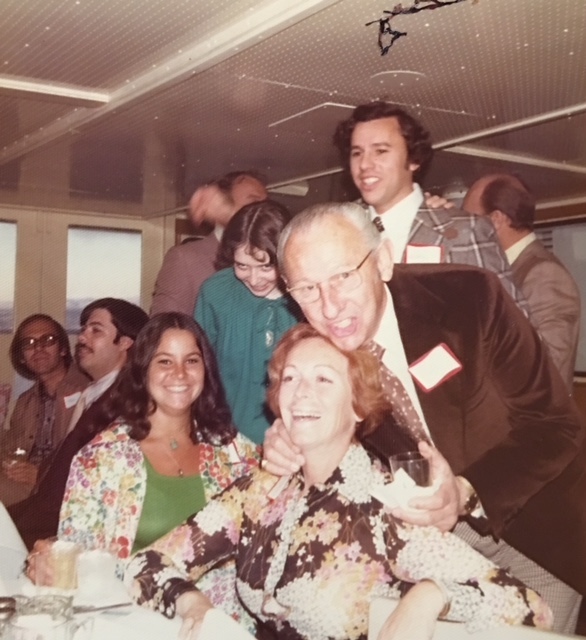 The family also opened/operated such eateries as Casa Carlita’s, Kibby’s Drive-In on the Peninsula and Z’s Bountiful Buffets. 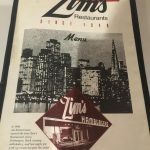 All told, the Zimmerman family ran 37 Bay Area restaurants including locations in Sacramento, Yuba City, Hayward, Woodside and in several locations in Marin County. 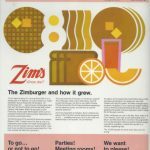 The Zimburger and how it grew. 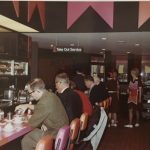 If you were an army G.I. 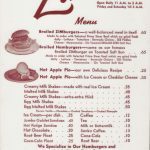 during World War II on a steady diet of K-Rations, it’s just possible you might daydream about things like hamburgers. 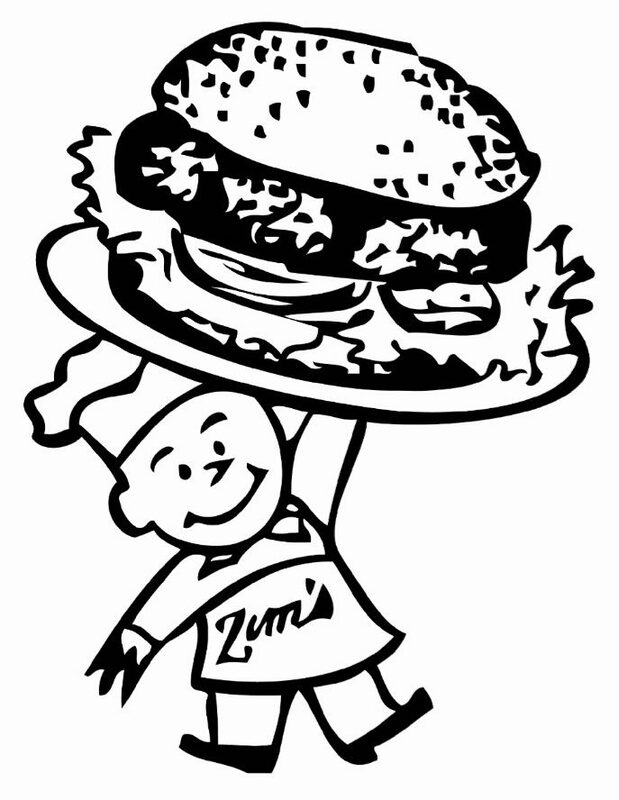 Art Zimmerman did….big and juicy hamburgers piled high will all the trimmings and served with a thick creamy milk shake. 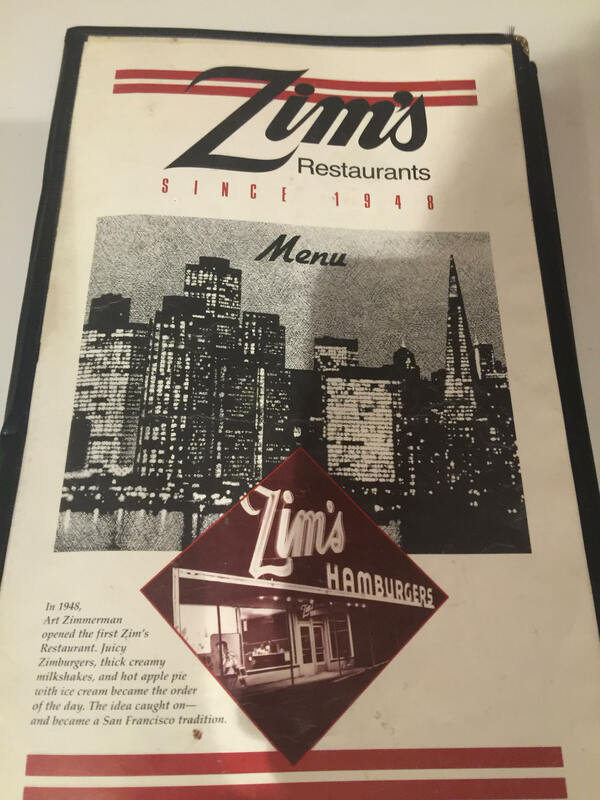 When he got back to San Francisco, those super-hamburgers were such an obsession that he went into business making them so everyone could enjoy them. 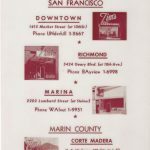 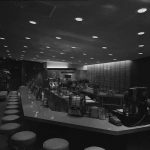 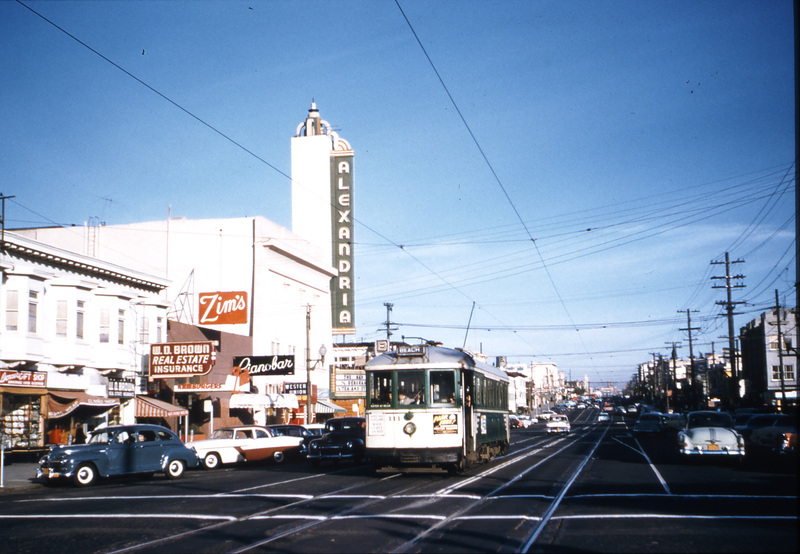 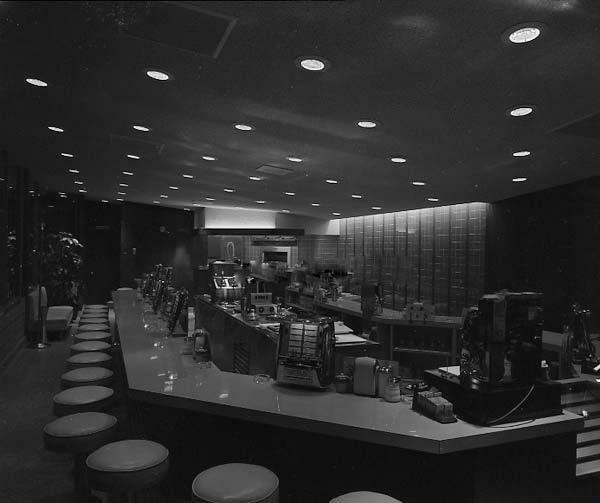 The first 25-stool Zim’s opened its doors on Lombard Street in San Francisco in 1947. 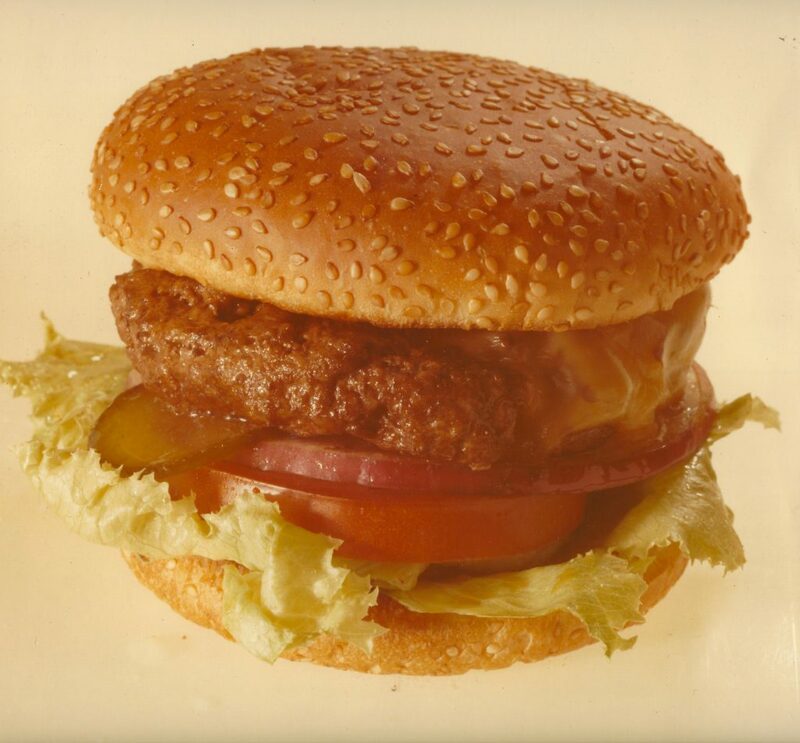 It wasn’t much to look at, but on a makeshift indoor broiler Art made hamburgers the likes of which nobody had ever tasted before. 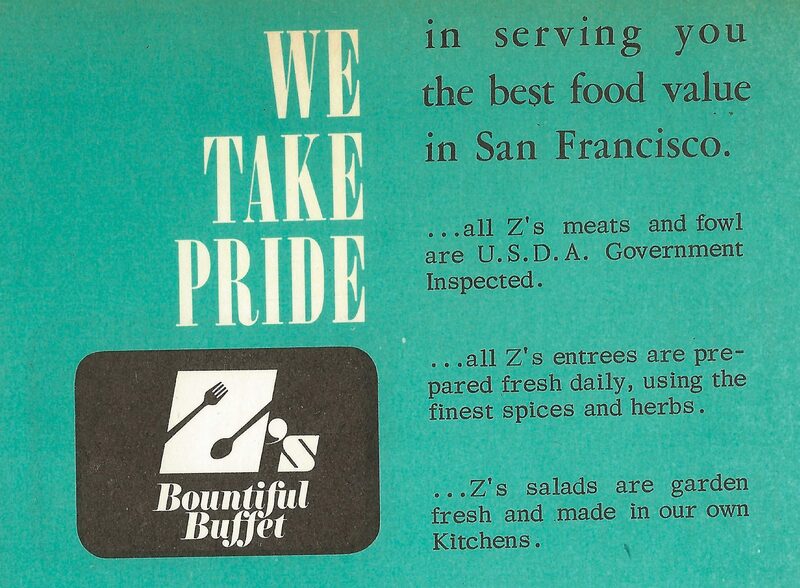 They cost more, but San Franciscans were ready for it. 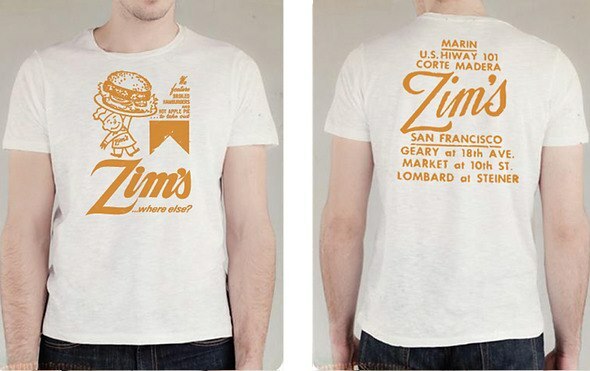 The lines outside the little Zim’s proved it. 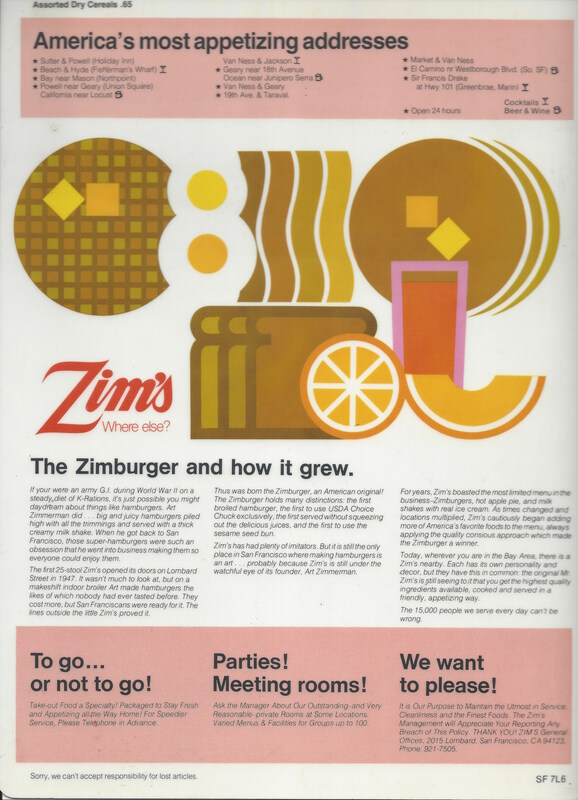 Thus was born the Zimburger, an American original!! 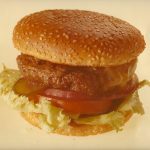 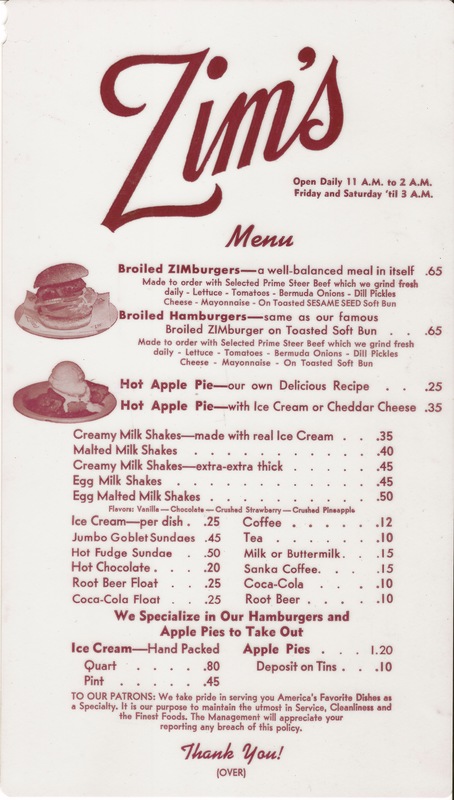 The Zimburger holds many distinctions: the first broiled hamburger, the first served without squeezing out the delicious juices, and the first to use the sesame seed bun. 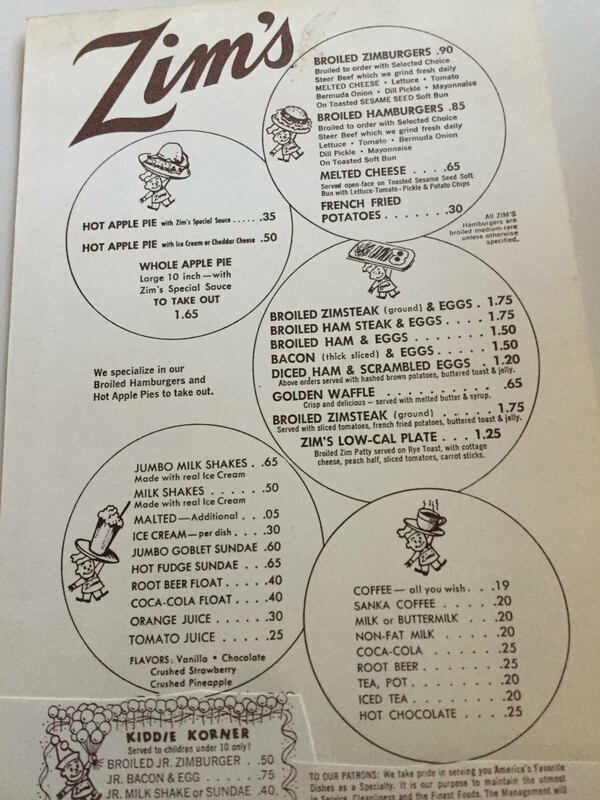 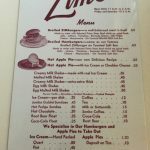 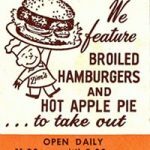 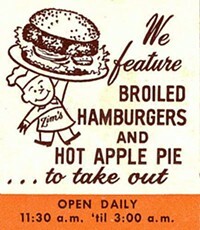 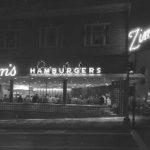 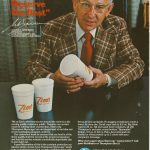 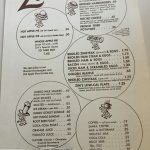 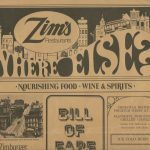 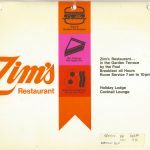 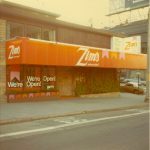 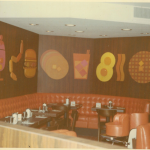 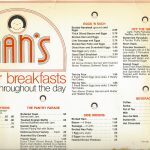 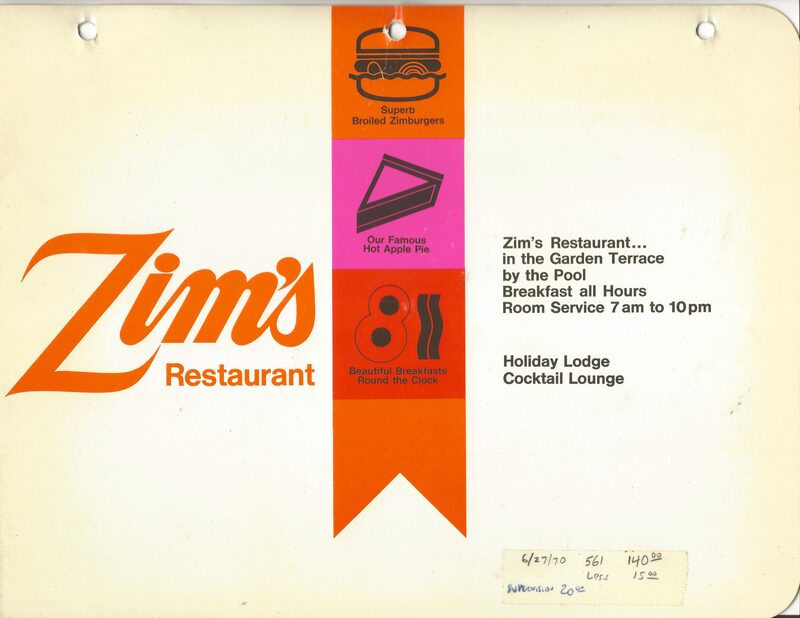 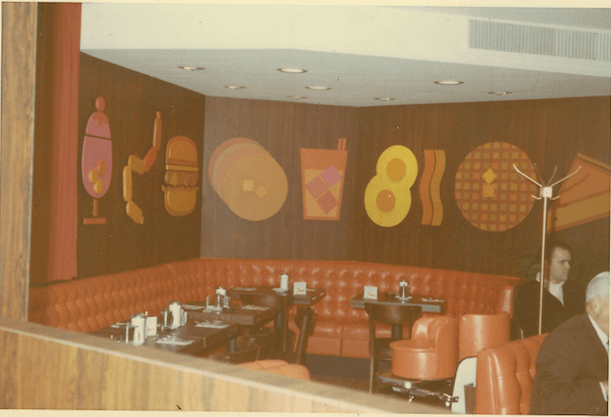 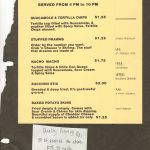 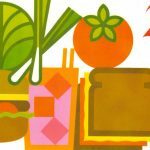 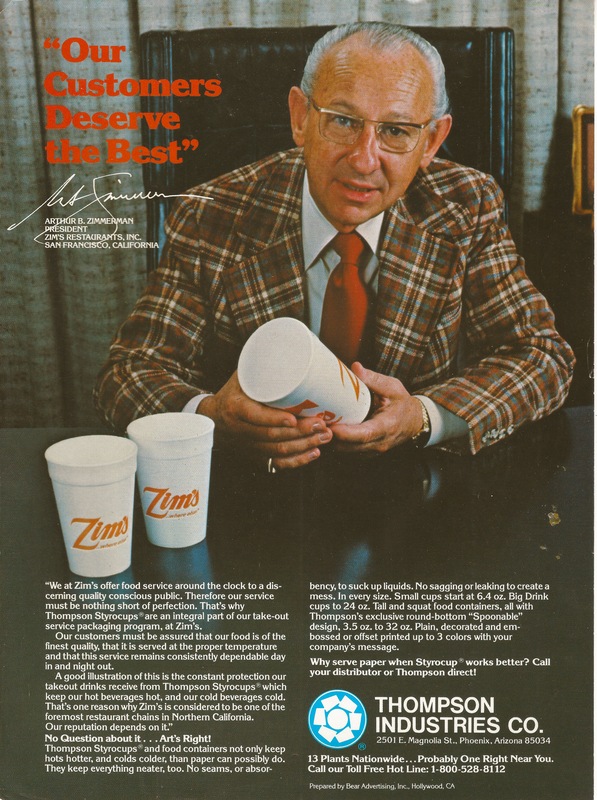 For years, Zim’s boasted the most limited menu in the business – Zimburgers, hot apple pie and milk shakes made with real ice cream. 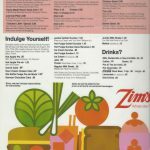 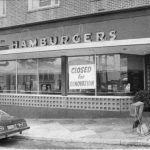 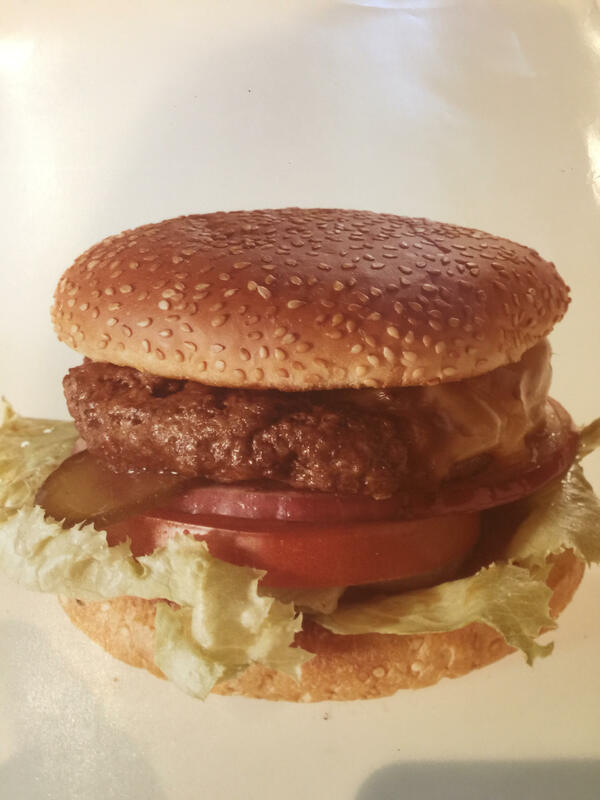 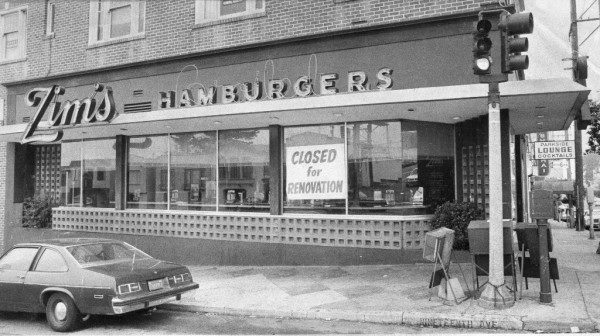 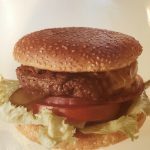 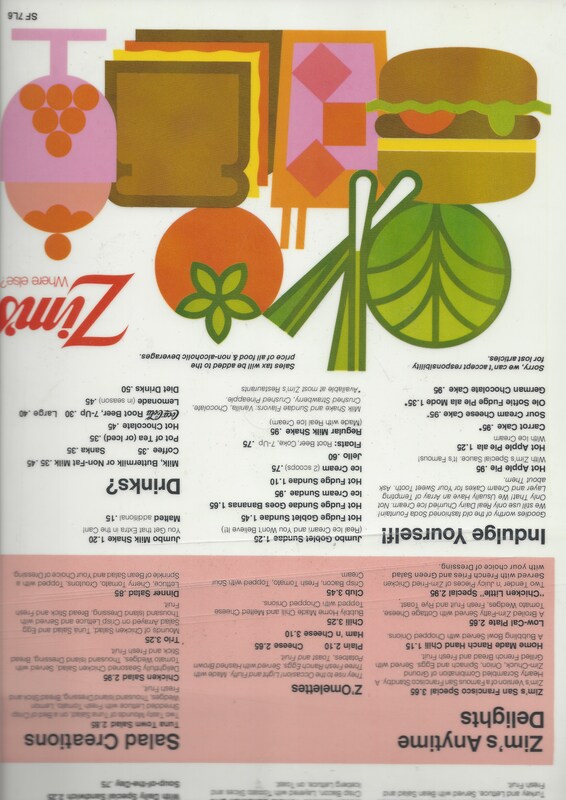 As times changed and locations multiplied, Zim’s cautiously began adding more of America’s favorite foods to the menu, always applying the quality conscious approach which made the Zimburger a winner. 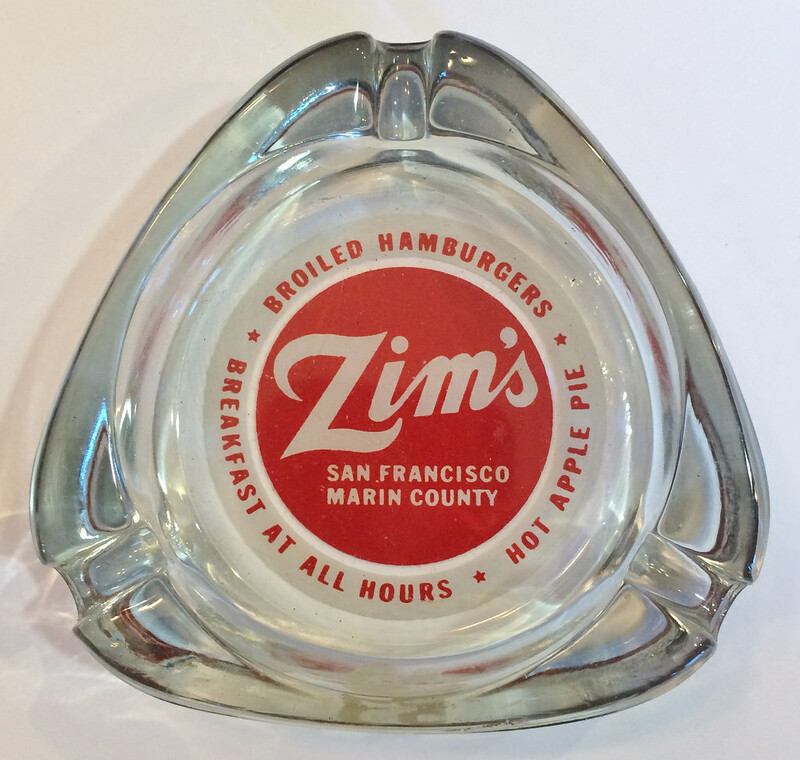 Today, wherever you are in the Bay Area, there is a Zim’s nearby. 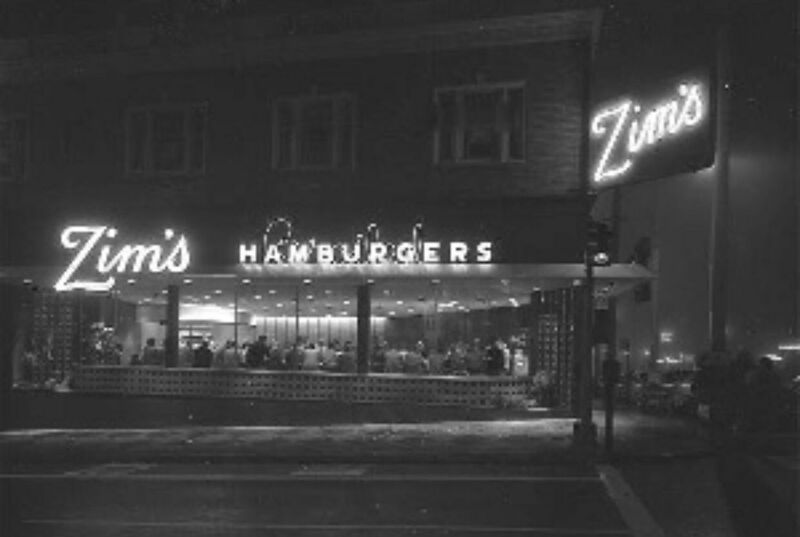 Each has its own personality and décor, but they have this in common: the original Mr. Zim’s is still seeing to it that you get the highest quality ingredients available, cooked and served in a friendly, appetizing way. 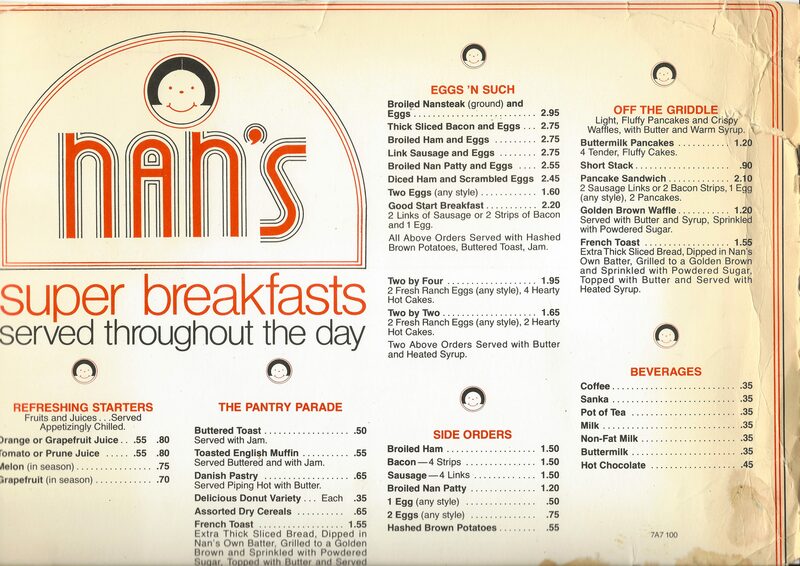 The 15,000 people we serve every day can’t be wrong. 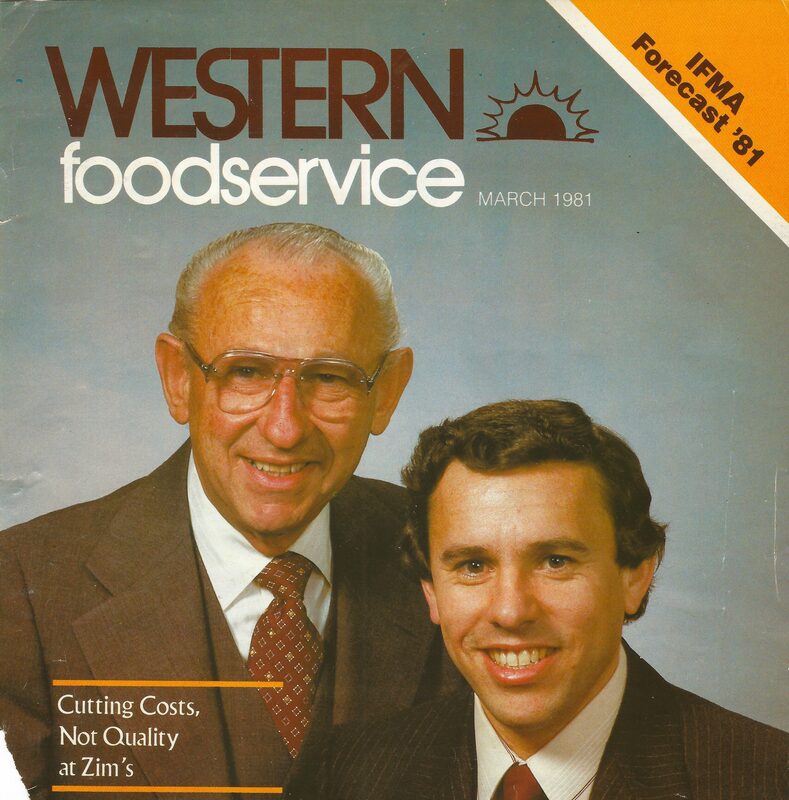 From the time I was a little boy, my father would encourage me to come into the business with the hope of eventually managing it. When I was eight years old, he would take me into the restaurant kitchen where I would stack cheese, cut apple pies, and double-grind hamburger meat, scooping out patties into individual portions on 6” x 6” wax papers. 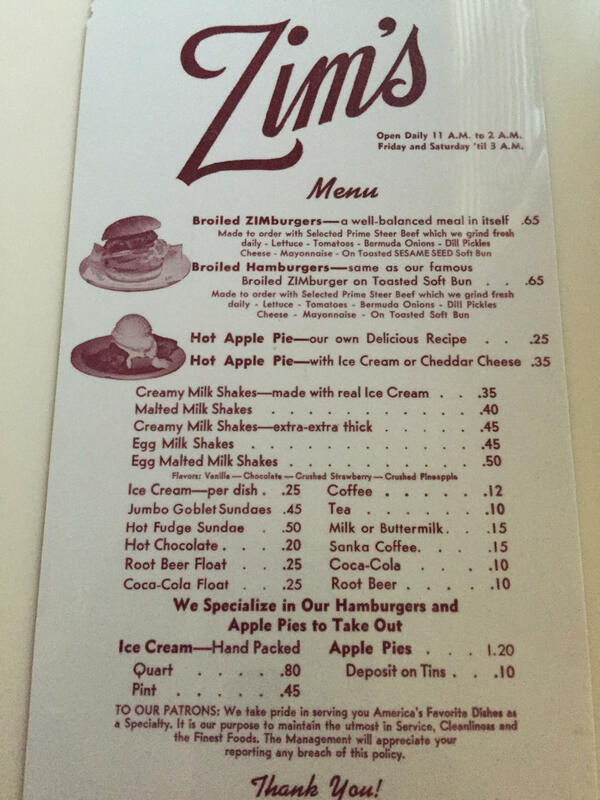 When I was older, I was introduced to the front of the house where I learned how to make milkshakes, floats, sundaes, and other fountain items. 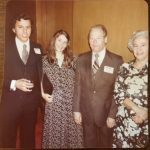 As a 13-year-old boy, I wanted to attend the International Boy Scout World Jamboree. 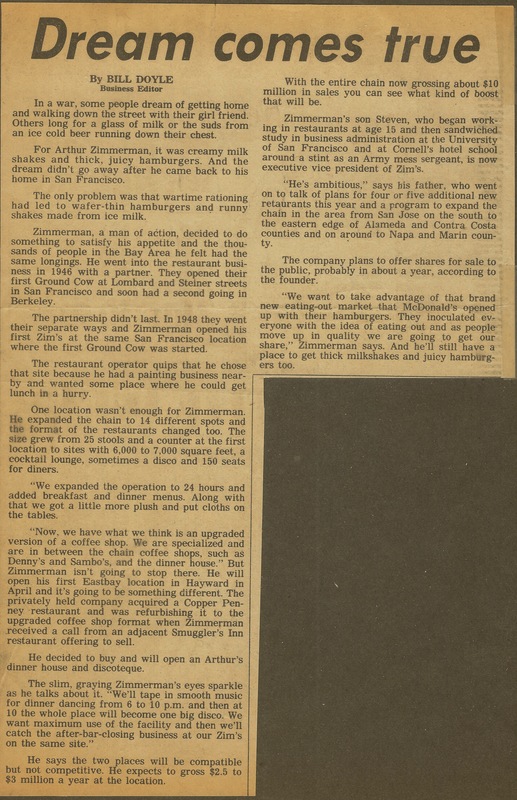 This one-week camping experience in Colorado Springs was held every four years in a different place, with Boy Scouts from around the world attending. 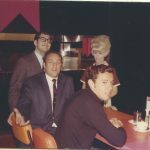 It cost a couple hundred dollars, and when I asked my father about paying for this experience he said it would be a good idea to pay for this myself, that maybe I should consider getting a part time job. 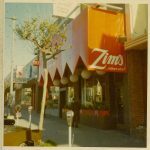 I couldn’t start working at Zim’s then because the law required that you be fifteen to get a work permit. 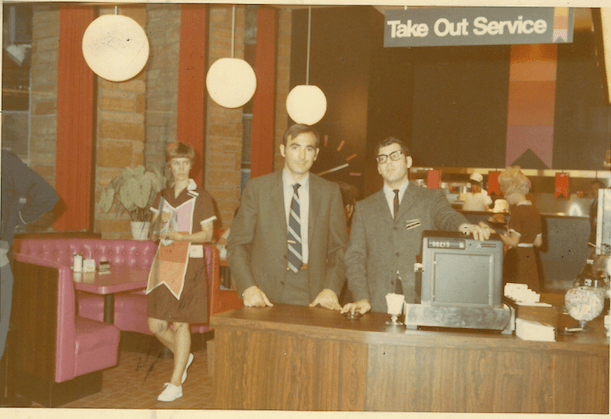 My father suggested I ask my cousin David, who owned a gas station in the city, if I could get a part time job working there on weekends and on holidays. 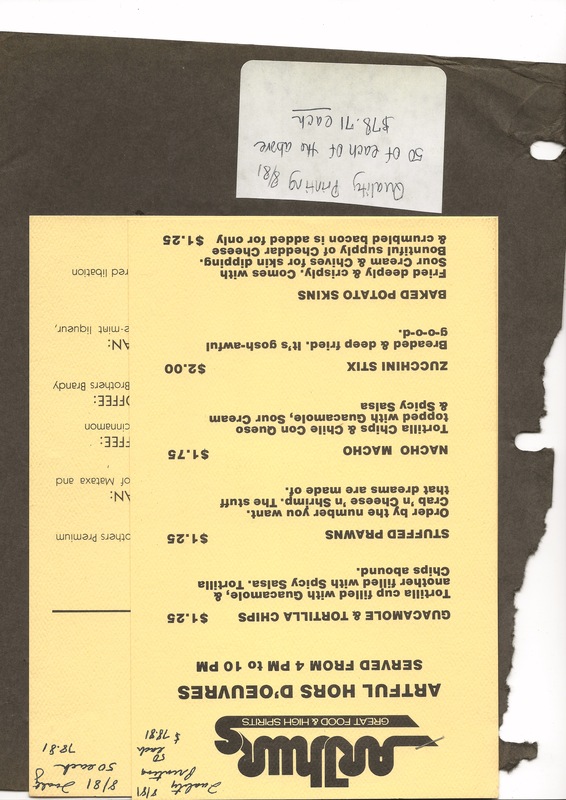 David was agreeable, and I worked very hard doing a lot of dirty jobs to earn my trip to the Boy Scout Jamboree. Many years later, my father told me that he had actually given my cousin the money to pay me for the work I did for him. 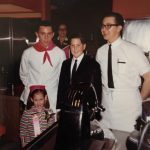 My father did this, because he felt that I would be very happy and appreciative to start working in a restaurant, when I compared it to the work I did at my cousin’s gas station. 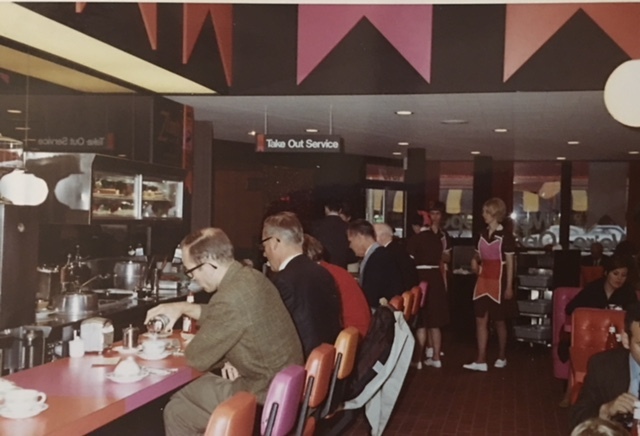 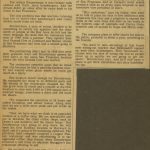 I was, in fact, very appreciative when, on my fifteenth birthday, I got to work in the restaurant; cleaning the bathroom toilets and washing dishes—an upgrade compared to the work I did in the gas station. 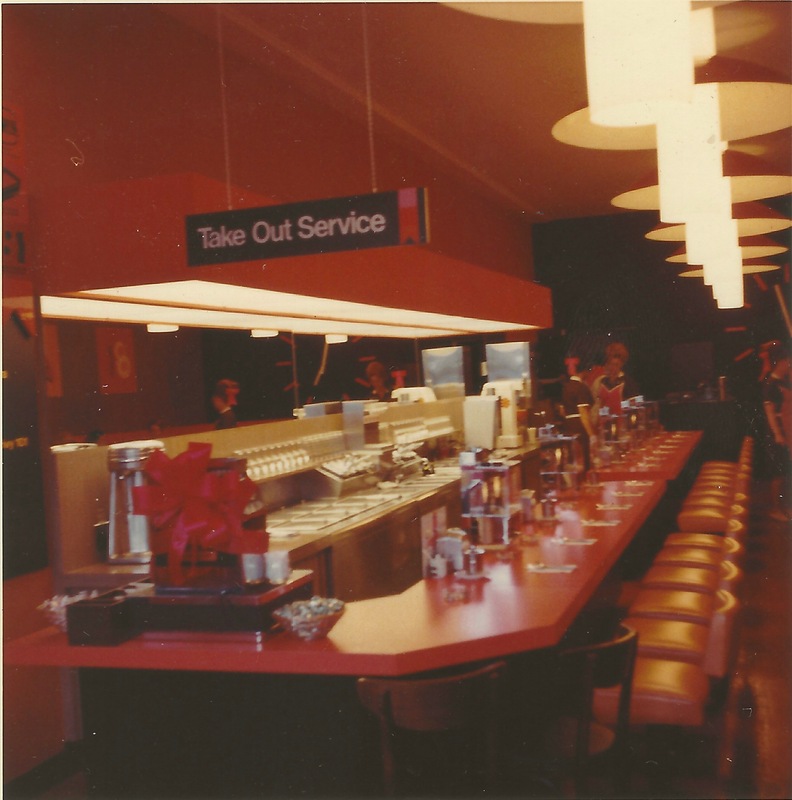 I worked inside, interfaced with customers and employees, and got to eat whatever I wanted. 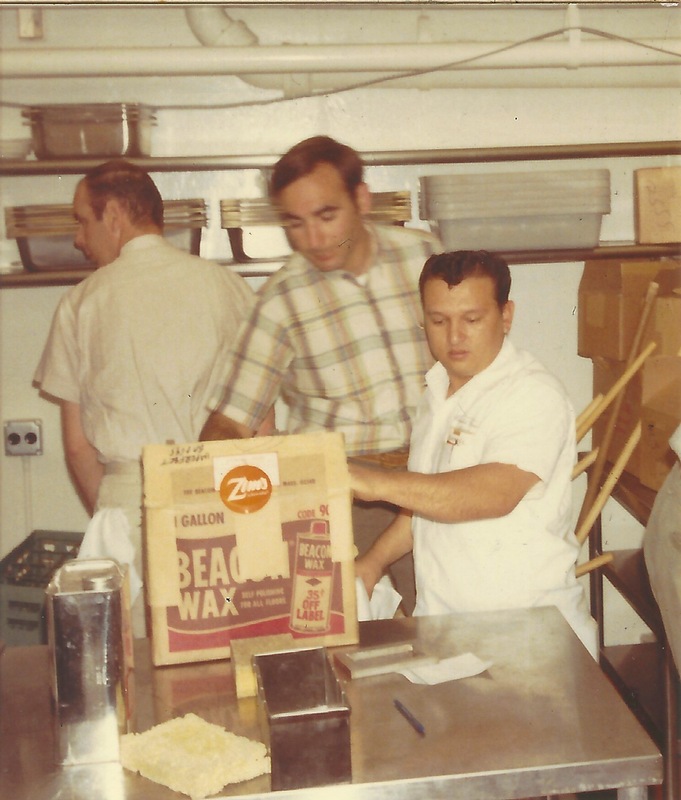 When I reflect on this period in my life, I tell people that I advanced from axle grease to kitchen grease. 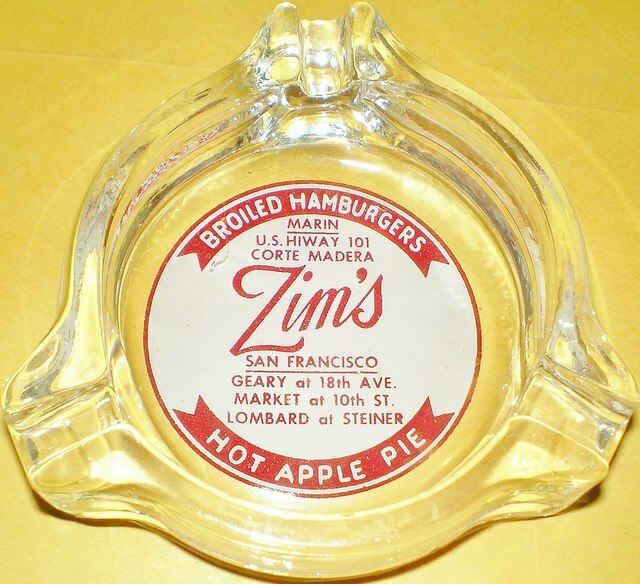 So instead of having my fingernails smell like gasoline, they smelled like onions as I always seemed to be assigned the task of peeling onions for the hamburgers. 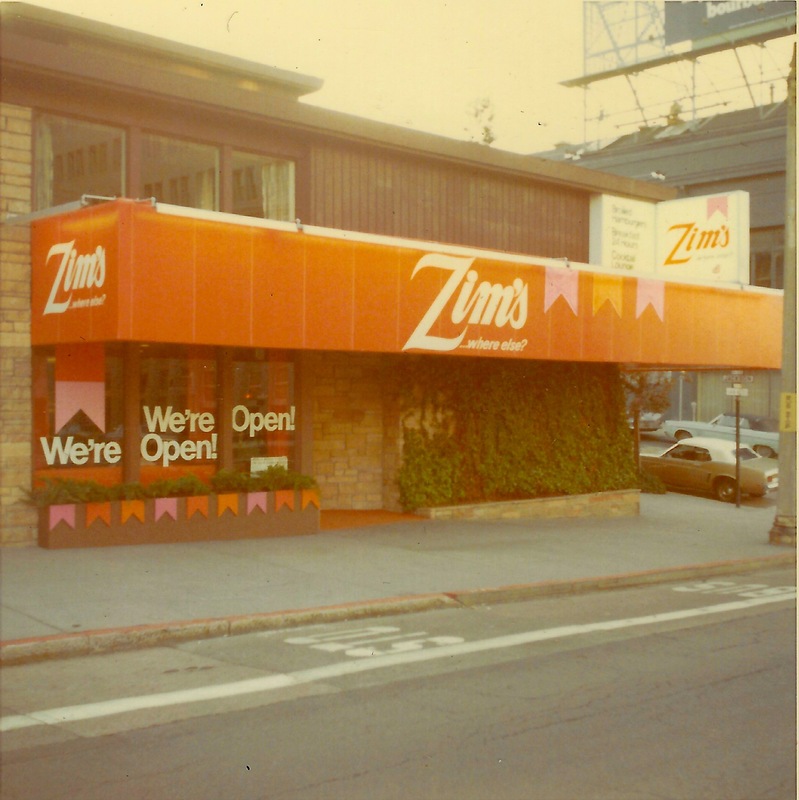 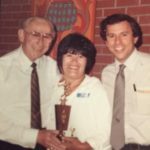 At age fifteen, I started at Zim’s as a regular employee, washing dishes on weekends, during the holidays, and during summer vacations. 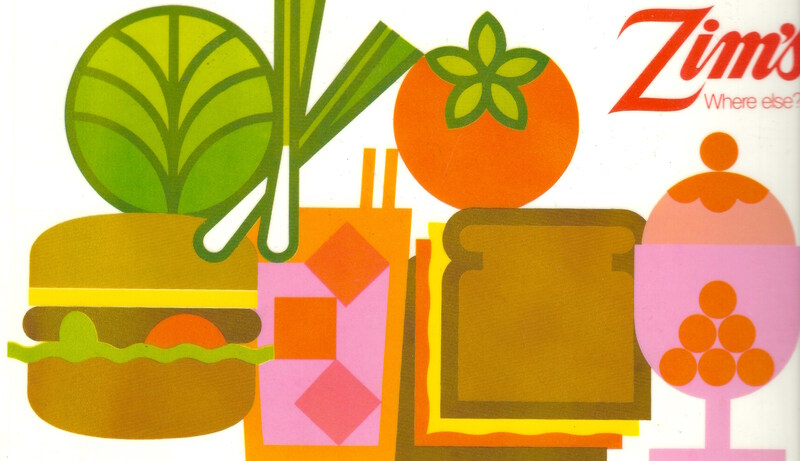 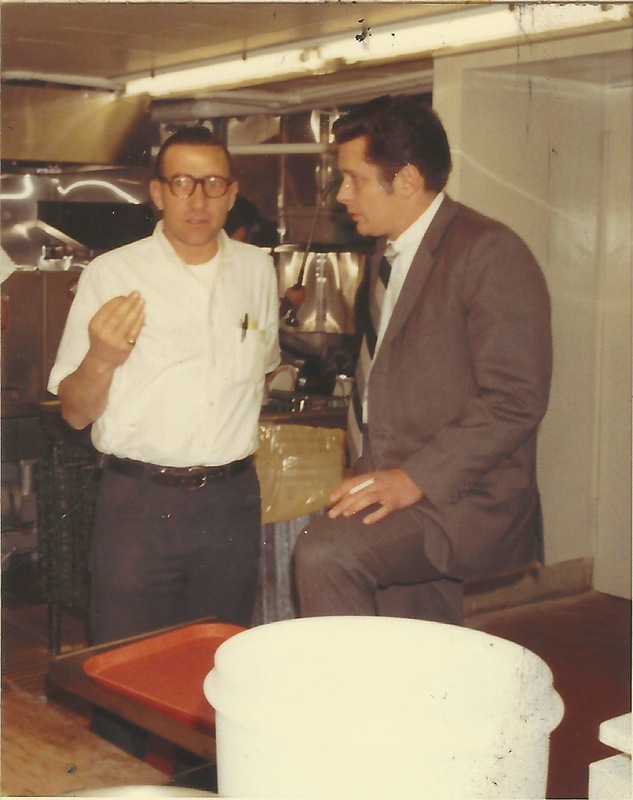 Throughout my high school years on weekends, holidays, and summer vacations, I worked in the restaurants cooking. 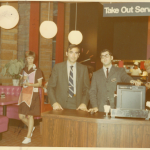 Shortly after entering college in 1967, during the Vietnam War, I enlisted into the United States Air Force Reserve as I didn’t want to be drafted into the Army. 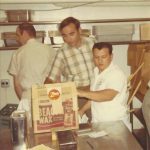 After completing my basic military training and returning to college, I was called to active duty for a two-year period, as a result of the invasion by the North Koreans against a United States intelligence ship, the USS Pueblo, when President Johnson activated thousands of reservists. 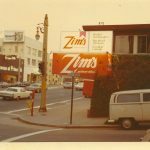 I spent most of that two-year period working as a cook in a mess hall at Hamilton Air Force Base in Novato, California, and continued working at Zim’s on the weekends, while taking college courses in the evening. 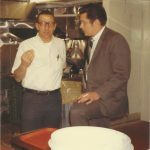 I learned a lot working in food service for the Air Force about volume cooking in that we fed several hundred Airmen daily. Also I learned a lot about maintaining high-cleanliness standards in the mess halls as the military was very strict about this. Once I got out of the Air Force, I earned a college degree in Business Administration from the University of San Francisco in 1970. 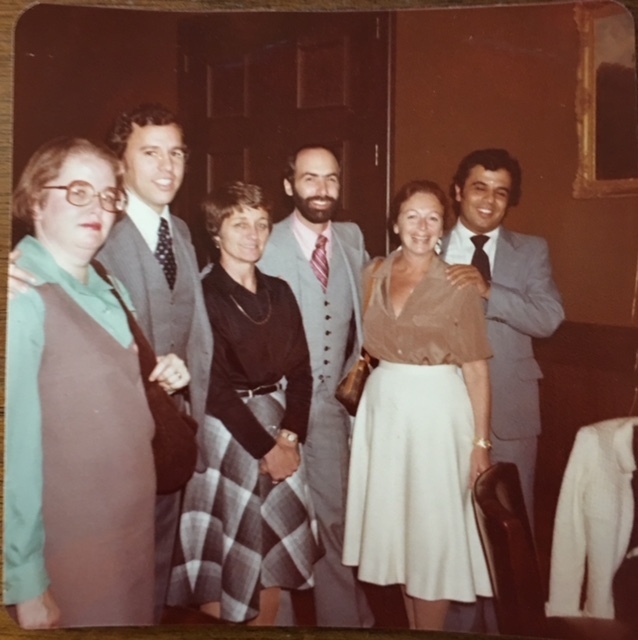 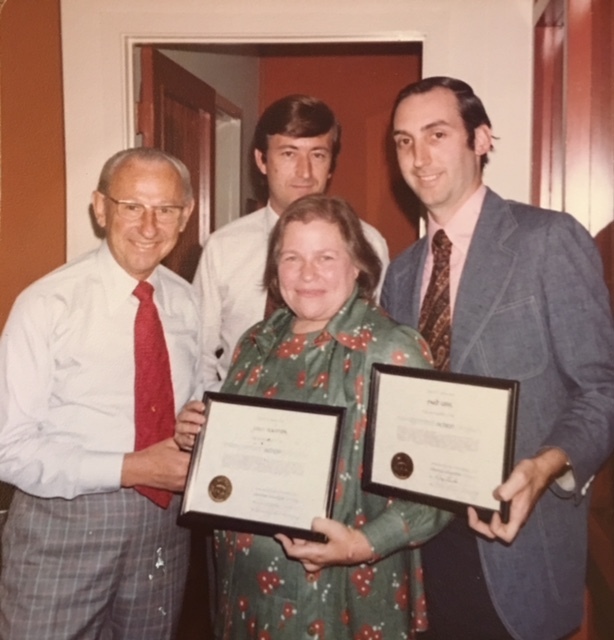 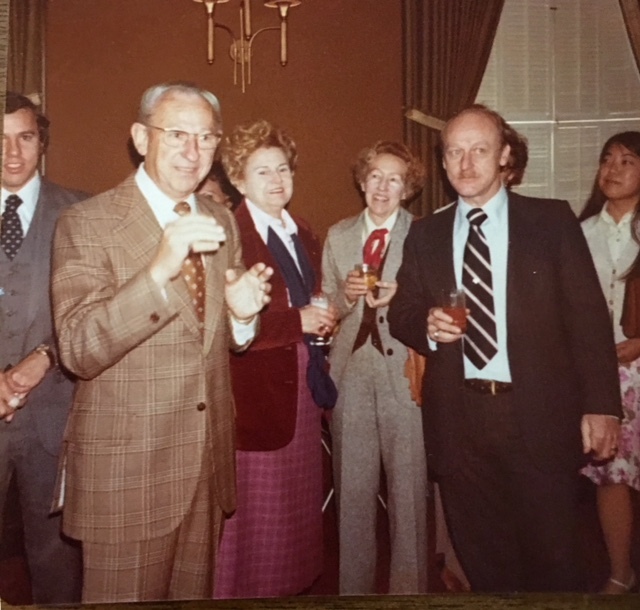 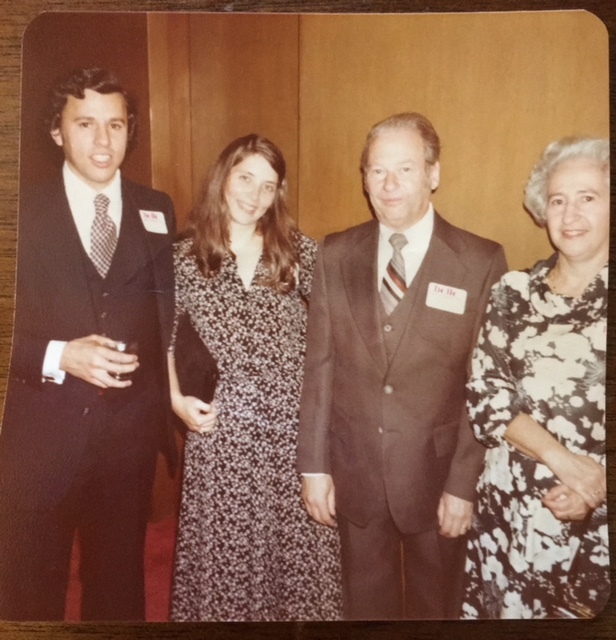 After a six-month traveling experience to Europe and Israel, I attended the School of Hotel Administration at Cornell University in Ithaca, New York in 1971. 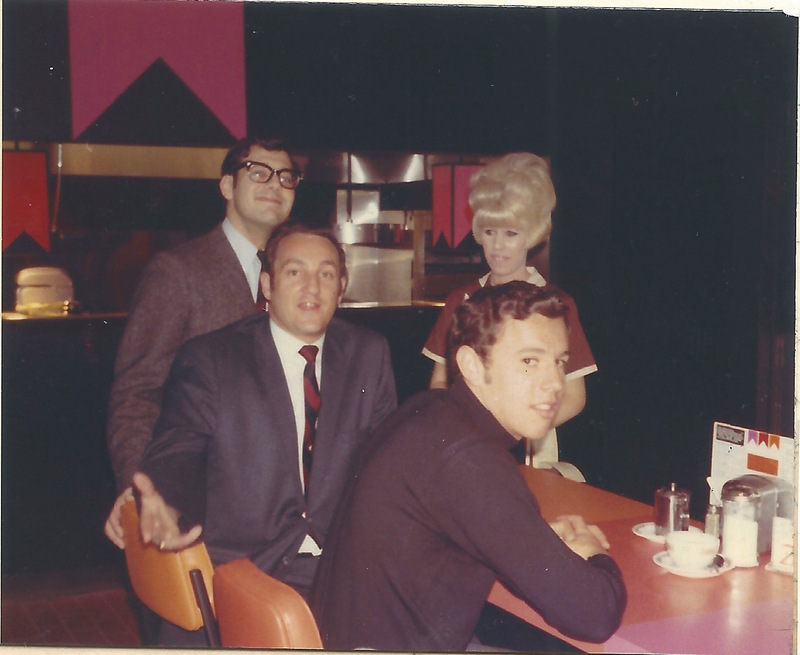 There I met my wife, Judy. We have been happily married for nearly forty years, with three grown children, all married and very successful. 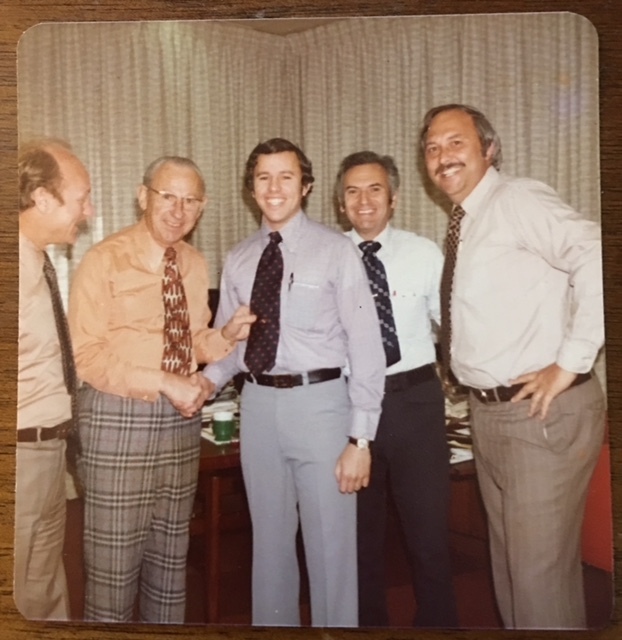 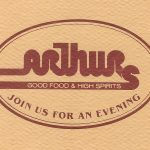 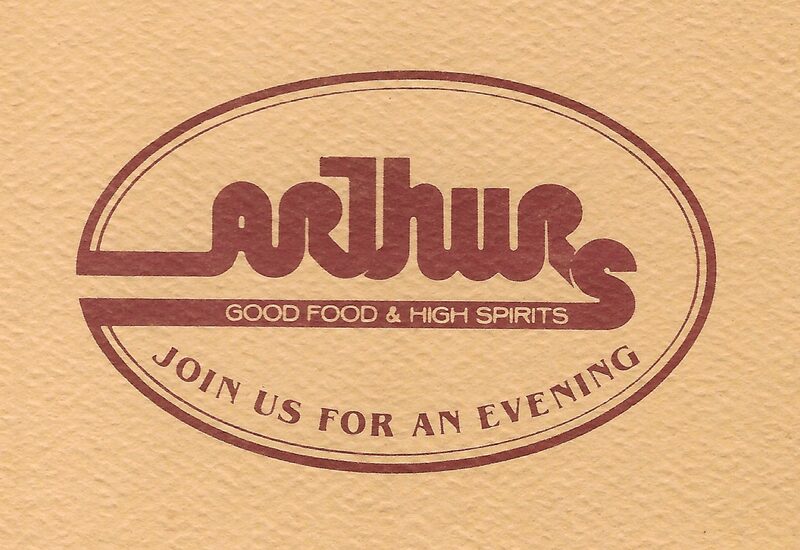 Immediately after graduating from Cornell in 1973, I started working in the family business full time, first as a manager trainee, working my way up through the ranks from assistant manager, manager, area supervisor, vice president, executive vice president, and finally, president and chief executive officer of the company. Some of my responsibilities throughout the years included hiring and firing personnel, including management; overseeing research and development of all new food products; training cooks, food servers and managers for new store openings; site selection; purchasing, scheduling, and budgeting; negotiating leases for new locations. 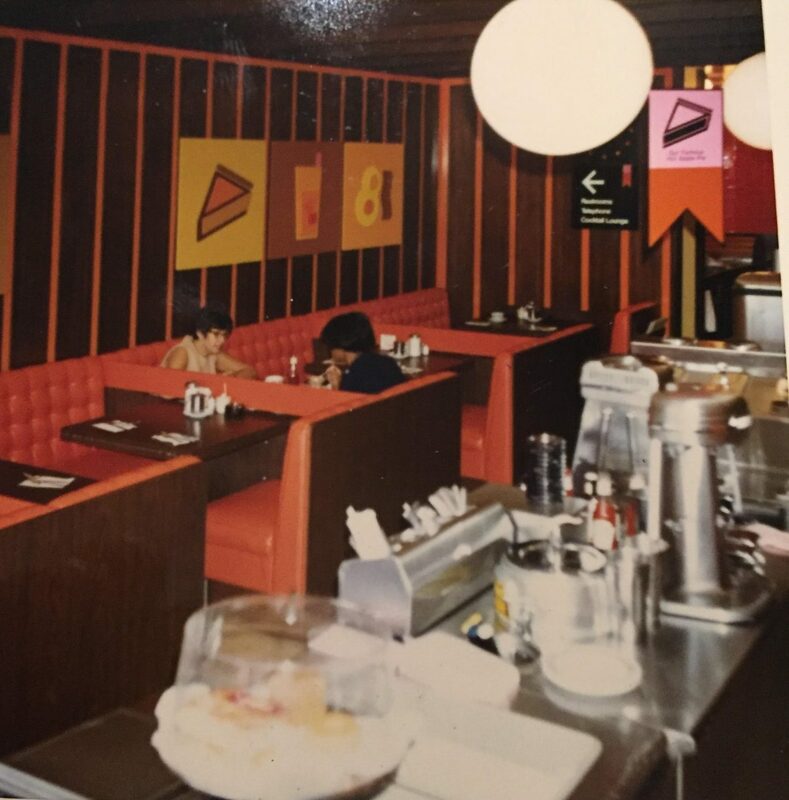 I also handled the acquisition of various existing restaurants we bought over the years, working with our design team in designing new units and remodeling existing units.